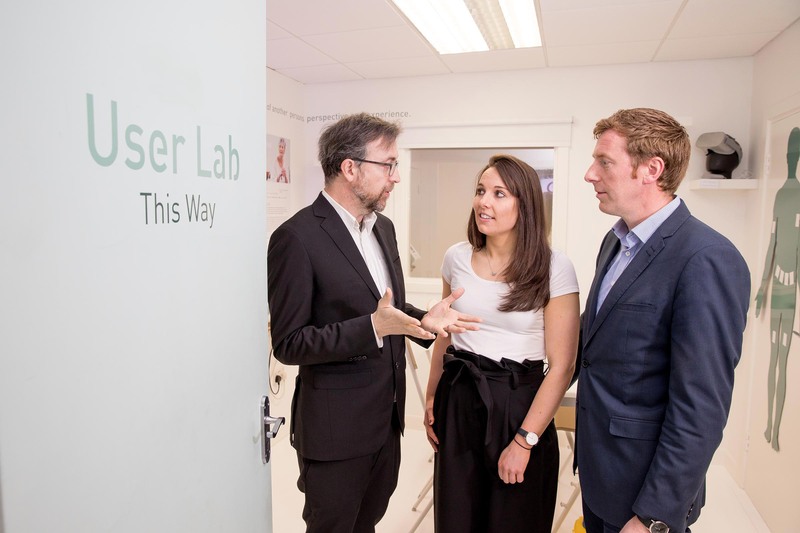 Leading Irish MedTech Company HealthBeacon unveiled its pioneering ‘Innovation partnership’ with Dublin City University, at the official opening of ‘HealthBeacon Labs’ – a new research and development facility at their recently expanded Dublin Headquarters. The partnership, designed to accelerate cutting edge innovation within the healthcare arena, underscores HealthBeacon’s commitment to innovation in medical technology and healthcare. Both parties will work together to build predictive patient behaviour models based on real-world insights, recognising the importance of data analytics in improving patient care. To celebrate the innovative venture, HealthBeacon hosted a “Business Breakfast Bytes” event. Guests heard from keynote speakers: Professor Tomas Ward, AIB Chair in Data Analytics at DCU and Funded Investigator, Insight Centre for Data Analytics, Kieran Daly CTO and co-founder HealthBeacon and Jim Joyce, CEO HealthBeacon and were invited on a tour of the new ‘HealthBeacon Lab’ facility, which includes both user experience and data lab. The partnership recognizes that the fusion of internet of things, technologies, artificial intelligence and large amounts of good quality data presents significant opportunities to meaningfully empower health care providers and their users, with insights which can lead to real improvements in healthcare delivery and patient-empowerment. “HealthBeacon is dedicated to identifying new pathways to improve healthcare challenges through collaborative partnerships. Our partnership with DCU will nurture critical innovation within the healthcare arena to assist the acceleration and creation of better solutions. This work will ultimately result in better health predictions for improved health outcomes and quality of care” Kieran Daly CTO & Co-Founder, HealthBeacon commented at the event. “The life sciences sector accounts for a significant level of Ireland’s export revenue and the ‘HealthBeacon and DCU Innovation Partnership’ is an opportunity to further build on our strong international reputation for excellence and innovation in healthcare and ICT companies. Through the programme new and emerging enterprises will have the opportunity to access expertise and resources to develop new and improve products, processes and services and will benefit through direct collaboration and coordination with Irish research institutes on opportunities within the marketplace”. At the event, the HealthBeacon team offered industry guests guided tours of their new “HB Lab” Facility. The new Data Analytics Lab & User Experience Lab, collectively called “HealthBeacon Labs” signals the next phase in growth for HealthBeacon. The HealthBeacon Data team expects to double in size by June this year and is ready for the next phase of expansion. The opening of ‘HB Labs’ marks a pivotal point for HealthBeacon to understand data driven and evidence-based patient needs.